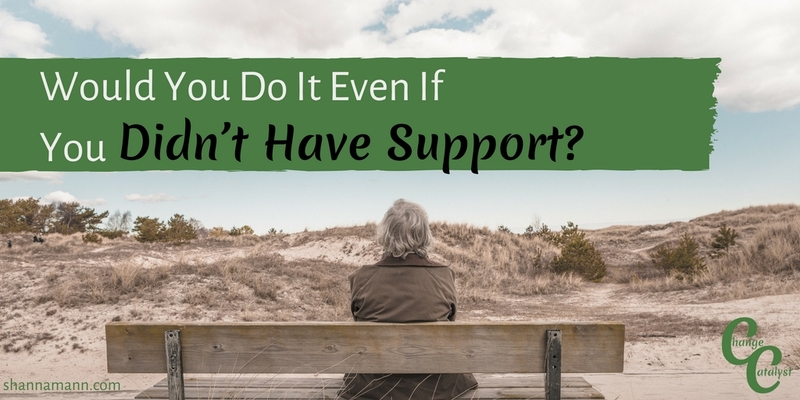 Would You Do It Even If You Didn’t Have Support? I was mentioning the other day that my philosophy seemed to be based on a lot of older principles that seemed to have fallen radically out of favor in recent generations. As an example, I offered this Aesop’s fable, which I have always liked a lot. A Lark, who had Young Ones in a field of corn which was almost ripe, was afraid lest the reapers should come before her young brood were fledged. Every day, therefore, when she flew away to look for food, she charged them to take notice of what they heard in her absence, and to tell her of it when she returned. One day when she was gone, they heard the master of the field say to his son that the corn seemed ripe enough to be cut, and tell him to go early tomorrow and desire their friends and neighbours to come and help to reap it. The owner came the next day, and, finding his relations as backward as his neighbours, said to his son., “Now, George, listen to me. Get a couple of good sickles ready against to-morrow morning, for it seems we must reap the corn by ourselves.” The Young Ones told this to their mother. “Then, my dears,” said she, “it is time for us to go indeed, for when a man undertakes to do his business himself, it is not so likely that he will be disappointed.” She removed her Young Ones immediately, and the corn was reaped the next day by the old man and his son. Let’s simplify the birds out of this: A man needs to harvest his crop, so first he sends for his neighbors to help. But they don’t come. So then he sends for his relatives. But they don’t come, either. Finally, he decides that he must do it himself, and he does. If you do any reading online, you’ll see that there is a lot of people in the first two stages; the government needs to help, society needs to help, I need my friends and family to hold me accountable, or to support me. But until you decide that you’re going to do a thing no matter who helps or doesn’t help then you’re not going to get anywhere. And that line is weird. It’s invisible, and you can’t usually find it again when you retrace your steps, like when you go through the wardrobe into Narnia. You can find the lightpost, but that’s it. And so when you tell people about it, it just sounds like you found a backbone or some kind of confidence or grit. But in reality, I think most people are just like the farmer– I can’t wait any longer, this has to be done! Circumstances force the issue more than innate character. And then people turn around and tell you that you are brave, because they didn’t feel the pressure of circumstances, so we tell ourselves this story that it has to do with character. And I suppose partly it does. The farmer could have sat around whining about not getting help while his crop rotted in the field. But I think most people (or at any rate the people who are called to entrepreneurialism) have enough of a sense that they can influence a situation personally to not sit on their hands even when they don’t have help. “Help,” I find — especially with entrepreneurialism — is a double-edged sword. A lot of people have opinions, and few have expertise. So what help can you get? Well, at best, you’re going to get someone who will assure you that you’re smart and resourceful, and that if you’re wrong at least you’re going to find out and fix it. Or they will help you to do the things that you know are essential, but have trouble doing, like getting proper rest and food. Those are the things that non-business types can help you with. In other words, you can’t expect too much or rely on them too heavily to meet your needs. But mostly, you’re going to have to meet your own needs. Does this sound awful? Uncomfortable? Unfair? Wrong? Yeah. Welcome to the jungle. Although you are bound to get help, you cannot rely on it to motivate you or to prompt you. You have to just decide that a thing is going to get done, and it’s going to get done by you. The other day I was talking to a client. One of her contractors had just announced her annual rate increase— 50% over her previous rate. It’s a lot of money, and my client wasn’t quite sure how to feel about it. On one hand— good for the contractor! We should always celebrate when a fellow business owner makes a positive move for their business. On the other hand, ouch. That’s a lot of money. It’s kind of funny— I just did the very same thing with our copywriting business. It’s a sound business move, the quality is there, the market will bear it. But my clients are corporations with dozens of employees, so that feels different. They probably spend more on copy paper than they do on content. But when it’s just you, it’s scary to have a fixed cost suddenly balloon. Even if you know she’s worth it. Even if you know you’d do the same. And even when you know it’s not personal, it still feels obscurely like a threat. A threat to the profitability and success of your business. Of course, most people squash that thought firmly. People deserve a living wage, and feeling conflicted about paying that wage doesn’t square up with our sense of ourselves. We’re progressive. We’re fair. So… we should just pay it, right? But it’s not so easy to say, “They’re worth it,” and cough up that extra dough. I mean, that’s not to say they aren’t worth it, either. But contractors, like all services we use to run our business, have to make sense from a value-added perspective. So when a contractor raises their rates, here’s how to figure out what to do. Ready? It’s a very simple three step process. What is it worth to me to get this stuff handled? What benefits accrued by having it handled? What does this person bring to the table that a replacement might not and can I make adequate use of that talent? But first, let’s refresh ourselves on how pricing works. We think of costs as being somehow fixed, but when it comes to services, you have to remember that the cost isn’t tied to some intrinsic worth, but rather it’s tied to what some individual feels it’s ‘worth’ to them not to have to deal with it. You could do it, but it’s not the best use of your time. 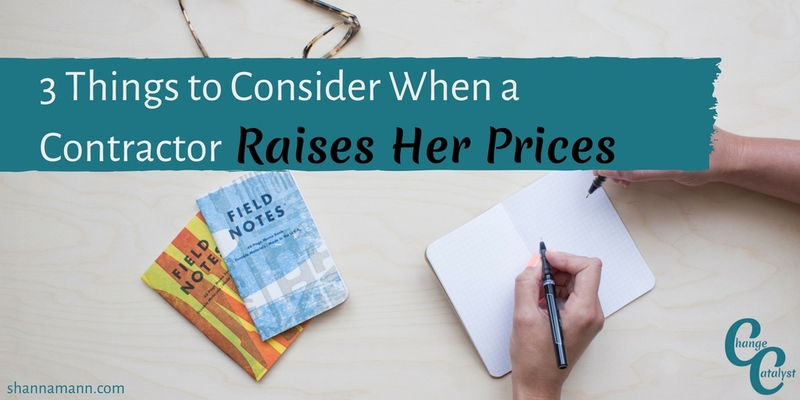 If you could hypothetically do it, you’re probably especially sensitive to price increases, because in your mind, it’s not that hard. On the other hand, if your audio engineer raises her prices, you’re more likely to feel it’s reasonable. You’re measuring it against both the time and expense it would take for you to learn to do it yourself. So that’s the first level of consideration for pricing— subjective worth. The second level of pricing we want to look at is opportunity cost. This means, how much more COULD you make if you didn’t have to deal with [outsourceable work]? Now, this doesn’t take into account the fact that you might (gasp) just do less work when you outsource to others. But you can still balance that against the bottom line, because too much work leads to burnout, which has its own associated costs. It’s just a little harder to get concrete numbers. So even though the raw numbers of the invoices you’re paying might be painful to gaze upon, you still have the ability to run the numbers and see if it actually is hampering your profitability. The third level of price reasoning is perhaps the most individual. We look at the concept of ‘worth’ as a function of the open market and of our hiring philosophy. Hiring philosophy is something none of us thinks about until we go into the hiring process and we realize that we have values driving our reasoning that we never articulated before. This makes more sense with examples. So for instance, if I have someone updating spreadsheets for me, I reason that this is a very easy job. It can be done with little training or skill and requires no subjectivity. It doesn’t even require good English, although for personal communication reasons I prefer it. So strictly speaking, I could hire this job out to a person in India for $3/hr. But I don’t. Why not? Another for instance. If I hire a VA to set up social media for me at $10/hr, if it takes her more than 5 hrs a month, am I better off just subscribing to Edgar? Under what circumstances would a human worker be more worthwhile in this situation? And why shouldn’t I just subscribe to Edgar from the get-go? Finally, how much is it worth it to me not to have to find and train a replacement as the cost of this particular service provider rises? Remember, for most roles, a person’s value to your business increases as they get to know you and your business. But, at the same time, are you making use of that information? Or are you having them fill in spreadsheets? You might think that there’s Right Answer to each of these scenarios. But there isn’t. It hinges on the way people think about the process of hiring, the reasons for hiring, and how they relate to their contractors. Now that we’ve looked at subjective worth, opportunity costs, and hiring philosophy, here are some questions to ask yourself. How much will the price increase affect your bottom line? Is is a few hundred a month, or a few thousand? 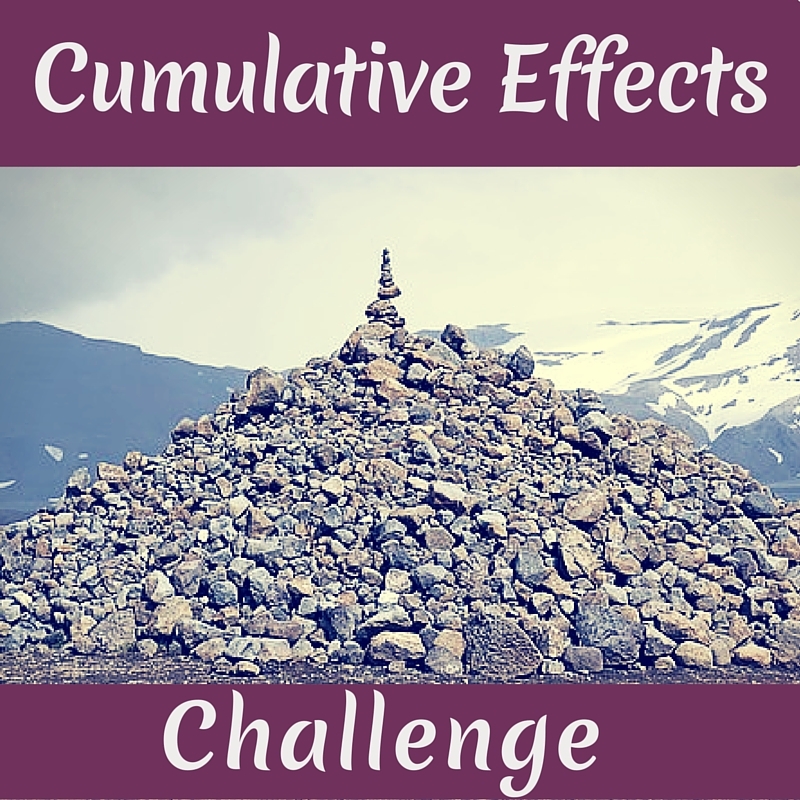 You don’t want to start shouting “The sky is falling!” if it’s only a matter of a few hundred dollars and/or the amount won’t meaningfully impact your quality of life or profitability. It might be slightly painful, and you might decide that the increase isn’t merited for the type of work you want done, so you let that contractor go and find another one. Either way, this is something you can roll with. What, exactly, is the contractor doing for you? Write out a list of specific tasks. Which ones are the high value, subjective ones? Which ones could you pass to someone a little less experienced? If you like this contractor, and at least SOME of her tasks are worth paying more for, simply decide what isn’t worth it and find someone else to do them. What ‘soft skills’ is this person bringing to the table? For instance, Thea has a lot of initiative, and I value that. That is a skill that’s more difficult to replace than the actual functional things she does for me. In general, tasks that are highly subjective (or, more concretely, require a lot of experience to perform well) are ones where people you trust can command quite a high premium, as long as it doesn’t affect the profitability of the business. Presumably, you are working to provide just this sort of highly-prized relationship in your own clients. Should it surprise you that your contractors are trying to do it with you? Am I using my contractor to her full potential? This is a tricky one, but you know, a lot of the time contractors raise their rates because they’re ready for bigger projects and more responsibility. Maybe if you only have $10/hr tasks for her, you’re better off letting her go do the $50/hr tasks that she would find more challenging and gratifying. If that’s the case, wish her well, give her a good reference, and ask if she has any up-and-coming colleagues she’d like to recommend to take her place. Finally, what’s my hiring philosophy? Some people hire for deep emotional resonance in the work. These are people who are very sensitive to their team culture, and even the VA who handles the email needs to be on the same wavelength. Some people are comfortable with spending money on the best person the can find for a given role— they prioritize high-achieving individuals with honed expertise. Some people want contractors who don’t require much if any oversight. They want people who will do the job they’re assigned and not bother them with anything. Some people love finding “a job for a person.” These are typically the uber-connectors, the ones who take a shine to someone and then work to find a place for them; sometimes working for them, sometimes with a friend. Me, I like to find hidden, undervalued gems, and polish them up, positioning them for bigger and better things. The way I see it, I get a highly capable worker for a while, I help them find and hone the value in their work, I point them towards potential opportunities, and see them climb. Eventually, they’ll raise their prices beyond what I’m prepared to pay, but by that time, they’ll have plenty of opportunity elsewhere. Yes, I’ll have to find someone else, but I like that process too. I like to explain what I want them to do and why, and I like to see people bloom into their role. Think about what your idea of a great contractor would be. How would you interact? How would you work together? How would you know when the time had come to part? And what price band do you see yourself in (keeping in mind that each price band comes with their own pros and cons)? Hopefully, you now have the tools you need to handle it gracefully (and logically) when you get that price rise email from your favorite contractors. Has this been something you’ve struggled with in the past? I’d love to hear stories! P.S., If you think this is something a friend or colleague should read, I’d be delighted if you’d forward it to them! The other day in my mastermind group, I was discussing the failure of a business. Not my business, but an acquaintance’s. I had seen it happening, and I thought it offered interesting opportunities for deconstruction — it failed not because the idea wasn’t sound or the founder wasn’t capable. Due to a couple of large constraints, it couldn’t scale large enough to support the founder in the runway she had available, and when time ran out, she had to move on to other things. The reason I was discussing it with my mastermind was to seek guidance in how to sensitively approach the topic of this dead business and ask her to share some lessons. If it had been my business, I would’ve felt no compunction about saying: here’s what happened. Here’s why it failed. Here’s a circumstance where it might’ve succeeded, but here’s why I ultimately decided not to take that path. I can tell you that about all of my failed businesses, and it’s good information, both to have and to share. And as an illustrative case study this business had several excellent features. If you can imagine me speechless here, please do so. I wasn’t speechless for long, but it’s difficult for me to recall another when an idea caught me so off guard. Is it hopeful, or at least emotionally tender, to refer to a business that didn’t work out for you as a failure? Linguist John McWhorter has an op-ed in the Wall Street Journal arguing that Shakespeare’s plays should be re-written because of the drift in the meanings of words. The problem isn’t that Shakespeare is hard to understand, it’s that we think we know what he was saying when we don’t. Similarly, if my use of the word failure seems to imply some moral judgment and put people on the defensive, I want to change my language to make sure my audience hears what I intend. But at the same time, I don’t want to get into those self-help-y parlour tricks where we move the goalposts until the word failure is essentially meaningless. Let me give you an example to show you how morally neutral my use of the word is. When a farmer plant the crop, he does it in the expectation of a certain return. Sometimes his crop is already sold at an agreed-upon price, and sometimes not, but either way, he is a pretty good idea of what his yield will be and what he’ll get come harvest. Because the investment in seed and chemical is so high, he takes out crop insurance so that if, for whatever reason (and there are many) things go south, he at least recoups his capital. So say there are unusually heavy rains right after seeding that wash the seed away. When the crop fails to sprout, the farmer calls his insurance, which sends out an adjuster, and the adjuster decides, based on how many seeds managed to sprout, that the crop was a “60% loss,” “80% loss,” “total loss,” or whatever. The farmer gets his money. Maybe he tries to reseed, or maybe he lets the spindly survivors grow. But nobody says to the farmer, “Why did you plant on this day?” (Although the farmer probably says it to himself.) No one says, “You should have worked harder,” because that would be ridiculous. Crop failure is just something that happens once in a while. If anything, his neighbours would congratulate him on the foresight or prudence to take out crop insurance, because not everybody does. And there can be instances of failure, that have nothing to do with the weather. If you plant half your farm to barley and then the bottom drops out of the barley market, then you’re going to grind your teeth and wish to hell you planted peas instead. Because you’re not going to get the ROI you anticipated, and that’s going to mean difficulties for your future cash flow, and for the next crop you need to buy seed for. But again, it’s no moral judgment on the farmer. 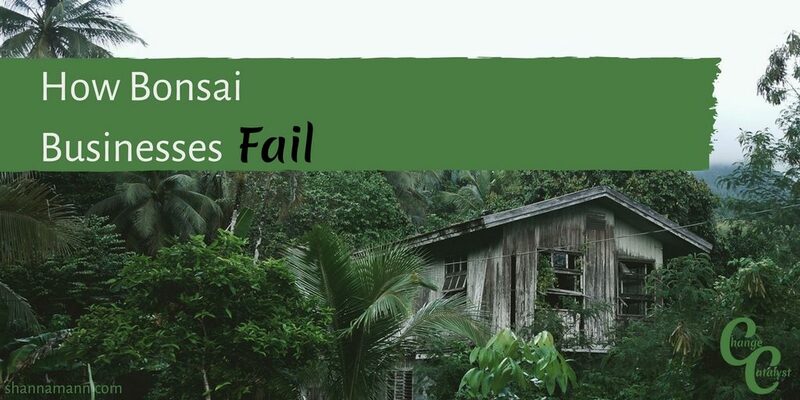 Believe it or not, bonsai businesses fail in the same way. When you think about it, businesses fail in the same way that most relationships fail — not because the people in the relationship are bad or broken, but because they couldn’t be with the other needed them to be. If your business fails, there’s no reason to see it as moral failure, or as personal failure. It just failed, just like crops fail. What matters is that you try again next year. Too busy to think about how your business runs? Get thought-provoking articles and actionable insights delivered to your inbox weekly!